In their pursuit of returning astronauts to the Moon, and sending crewed missions to Mars, NASA has contracted with a number of aerospace companies to develop all the infrastructure it will need. In addition to the Space Launch System (SLS) and the Orion spacecraft – which will fly the astronauts into space and see them safety to their destinations – they have teamed up with Lockheed Martin and other contractors to develop the Deep Space Gateway. This orbiting lunar habitat will not only facilitate missions to and from the Moon and Mars, it will also allow human beings to live and work in space like never before. On Thursday, August 16th, Lockheed Martin provided a first glimpse of what one the of habitats aboard the Deep Space Gateway would look like. It all took place at the Kennedy Space Center in Florida, where attendees were given a tour of the habitat prototype. At it’s core, the habitat uses the Donatello Multi-Purpose Logistics Module (MPLM), a refurbished module designed by the Italian Space Agency that dates back to the Space Shuttle era. Like all MPLMs, the Donatello is a pressurized module that was intended to carry equipment, experiments and supplies to and from the International Space Station aboard the Space Shuttle. While the Donatello was never sent into space, Lockheed Martin has re-purposed it to create their prototype habitat. Measuring 6.7 meters (22 feet) long and 4.57 meters (15 feet) wide, the pressurized capsule is designed to house astronauts for a period of 30 to 60 days. According to Bill Pratt, the program’s manager, it contains racks for science, life support systems, sleep stations, exercise machines, and robotic workstations. This habitat is one of several components that will eventually go into creating the Deep Space Gateway. These will include the habitat, an airlock, a propulsion module, a docking port and a power bus, which together would weigh 68 metric tonnes (75 US tons). This makes it considerably smaller than the International Space Station (ISS), which weighs in at a hefty 408 metric tonnes (450 US tons). Moreover, the DSG is one of several components that will be used to return astronauts to the Moon and to Mars. As noted, these include the Space Launch System (SLS), which will be the most powerful launch vehicle since the Saturn V (the rocket that carried the Apollo astronauts to the Moon) and the Orion Multi-Purpose Crew Vehicle (MPCV), which will house the crew. However, for their planned missions to Mars, NASA is also looking to develop the Deep Space Transport and the Mars Base Camp and Lander. The former calls for a reusable vehicle that would rely on a combination of Solar Electric Propulsion (SEP) and chemical propulsion to transport crews to and from the Gateway, whereas the latter would orbit Mars and provide the means to land on and return from the surface. All told, NASA has awarded a combined $65 million to six contractors – Lockheed Martin, Boeing, Sierra Nevada Corp.’s Space Systems, Orbital ATK, NanoRacks and Bigelow Aerospace – to build the habitat prototype by the end of the year. 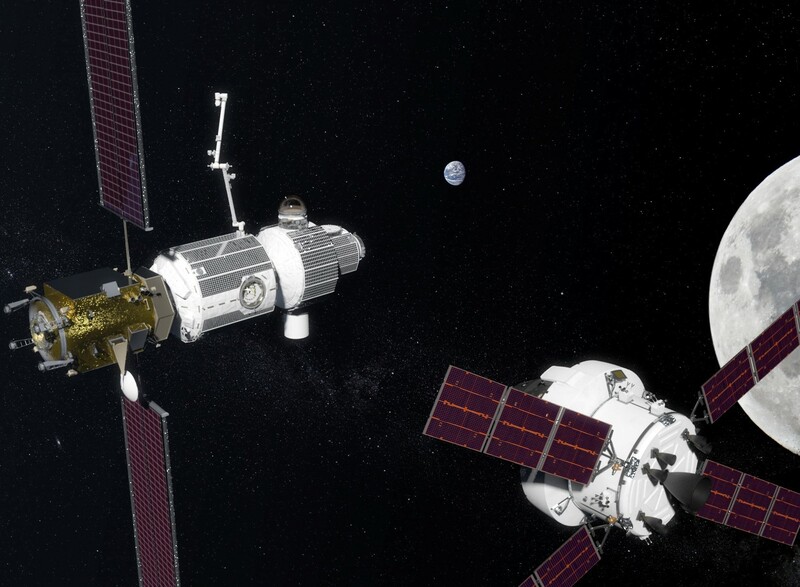 The agency will then review the proposals to determine which systems and interfaces will be incorporated into the design of the Deep Space Gateway. In the meantime, development of the Orion spacecraft continues at the Kennedy Space Center, which recently had its heat shields attached. Next month, the European Space Agency (ESA) will also be delivering the European Service Module to the Kennedy Space Center, which will be integrated with the Orion crew module and will provide it with the electricity, propulsion, thermal control, air and water it will need to sustain a crew in space. Once this is complete, NASA will begin the process of integrating the spacecraft with the SLS. NASA hopes to conduct the first uncrewed mission using the Orion spacecraft by 2020, in what is known as Exploration Mission-1 (EM-1). Exploration Mission-2 (EM-2), which will involve a crew performing a lunar flyby test and returning to Earth, is expected to take place by mid-2022. Development on the the Deep Space Transport and the Mars Base Camp and Lander is also expected to continue. Whereas the Gateway is part of the first phase of NASA’s “Journey to Mars” plan – the “Earth Reliant” phase, which involves exploration near the Moon using current technologies – these components will be part of Phase II, which is on developing long-duration capabilities beyond the Moon. If all goes according to plan, and depending on the future budget environment, NASA still hopes to mount a crewed mission to Mars by the 2030s.